On the 14th of December 2012, the UTA received a request from the Table Grapes CPAC to conduct a soil classification and draw up a soil map for the Lushof Boerdery and WCB Farm. Although these farms are situated on the same premises, the management is different. Lushof Boerdery is a worker’s Trust and Mr. Warren Bam is part of it. He also have his own portion that measures 13.5 ha, that he is leasing from a neighboring farm, the name of this farm is WCB Farming. Both farms envisaged farming with table grapes. The soil classification was done on 6.8ha at Lushof Boerdery and 5.1ha at WCB Farm. The UTA appointed Farm Secure to conduct the classification and draw up the soil map. 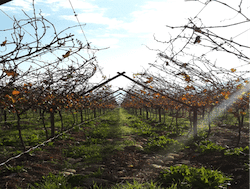 The results of the soil classification indicated that the soil is suitable for table grapes production, and recommendations were provided on how the soil should be prepared and maintained to ensure maximum yield. Upon receipt of the results, Mr. Bam and his colleagues from Lushof Boerdery proceeded and performed the tasks as were recommended to them and prepared the soil for the planting of table grape vines. During September 2012, 5.2 hectares of table grapes were planted at Lushof Boerdery. This was in addition to the 43 ha already planted. Currently 140 people were appointed to prepare the harvest while 180 are appointed during the packing period. The farmers were able to harvest 1500 cartons per ha during their first year of planting on the 3ha planted and sold for R100 per carton. The grapes were exported to UK, USA and Europe through Cape Span. On WCB Farm, 3ha of Adora Seedless are currently planted and the rest of the hectares are currently under preparations for planting. Currently 37 people are employed by this farm. Mr. Bam and his colleagues are singing praises for the Western Cape Department of Agriculture, Casidra and the UTA for the support that they have received.